Uber, Lyft, Google’s Waymo—much of the auto industry’s shown a recent interest in launching taxi services of their own, with the hope of one day operating fully-autonomous cars without a driver. 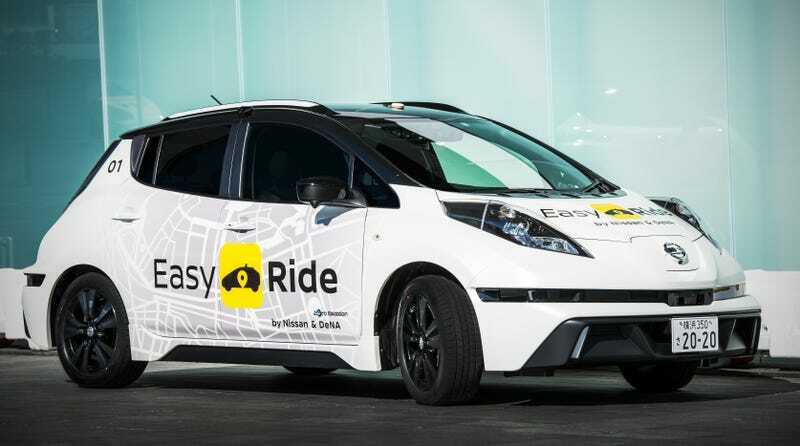 Next month, Nissan joins the crowded field, as the automaker plans to launch a taxi business in Japan it’s calling Easy Ride. Nissan’s partnering with DeNa to launch the service, and early on, testing will be done in a limited capacity. Starting in the Minato Mirai district of Yokohama, riders can hail a self-driving Nissan Leaf using a new smartphone app, reports The Verge. The vehicles will be geofenced along a 4.5-kilometer route between Nissan’s global headquarters and the Yokohama World Porters shopping center. Safety drivers will remain behind the wheel of the vehicles, and a remote operations center has been set up to monitor the car trips. The companies say they will expand the service to a much wider market by 2020. The auto industry’s betting heavily that ride-hailing services like Uber and Lyft are going to continue gathering steam in the years to come. Nissan’s addition, in particular, to the already-crowded field should be interesting. Uber has been in retreat for the last year outside of the U.S., thanks to stiff competition from other startups looking to capitalize on the business it sparked several years ago. Which raises a point that goes undiscussed far too often when talking about new taxi-like services. No one’s really cracked how to produce a sustained profit; instead—at least between Uber and Lyft—there’s a race to see who can artificially suppress the price of rides the most to garner new passengers by using the money companies raise from investors. Adding new competitors—like one of the biggest auto companies in the world—to the mix just means it’s going to be even harder to reach a point where they’re generating sustainable profits. And, as The Verge points out, Nissan’s going to have heated competition from the outset. Nissan will have heavy competition on its home turf. Sony recently announced that it would be partnering with Daiwa Motor Transportation and five other local taxi companies in Japan to build a new taxi-hailing system to match drivers with riders via a mobile app. Both pushes come at the same time that Uber CEO Dara Khosrowshahi, who was recently in Tokyo, is attempting to make new inroads into the Japanese market. Khosrowshahi met with executives at Toyota about “growing our #autonomous partnership and lessons 4 me in building a great culture,” he tweeted. Until someone figures out you can’t make the kind of profits out of taxis that large corporations want and need, the ride-hailing battle feels like it’ll eventually end up a cutthroat race to the bottom.